As mentioned on week 3 of the Holiday Countdown, I decided to partake in my first ever cookie exchange this year. I wanted to keep it small scale because you never know how busy the weeks can be leading up to Christmas. I thought it would be fun to share a couple of my family’s favourites and in return taste something new without having to make it. I was certain my friend Sandi would be up for it. She’s always in the kitchen whipping something up and has a natural talent for creating something amazing. Let’s just say the cookies she brought for the exchange didn’t disappoint. I found this Martha Stewart biscotti recipe a few years ago and it has become a family favourite. I make the recipe the same except I substitute chopped almonds for pistachios. If you find the dough too dry while mixing, just add a tablespoon or so of milk. 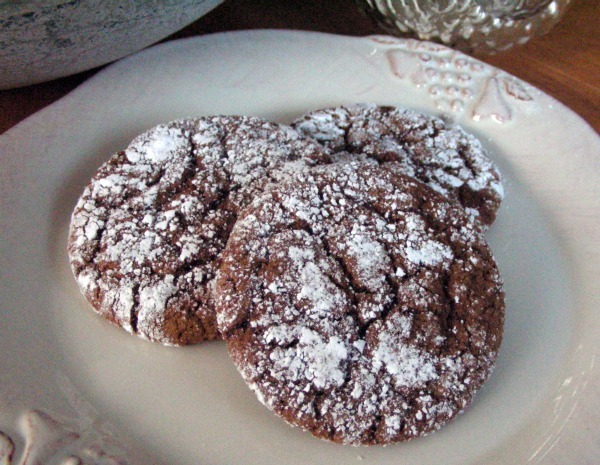 These cookies pair perfectly with coffee, tea or a glass of milk. They’re dry like traditional biscotti, but have a bit of chew. Preheat oven to 300°F. Line baking sheet with parchment paper and cover with a single layer of pretzels. 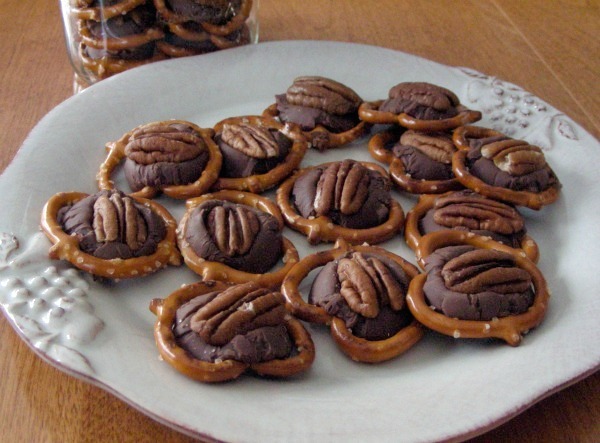 Place one Rolo on the center of each pretzel. Bake for 4 to 5 minutes until Rolos are soft, but not completely melted (they will still look whole). Remove from oven and immediately place one nut face up onto each Rolo pressing down to spread out the chocolate and caramel. Let completely cool before removing from pan. I bought four packs of Rolos which makes 40 pretzels. You’ll love the chewy texture combined with salty and sweet. The kids can easily help out with this recipe because they are quick and simple to make. I found it helpful to have an extra set of hands to press the nuts down before the Rolos cooled too much. These are chewy, sweet and salty, with a bit of crunch- totally divine! 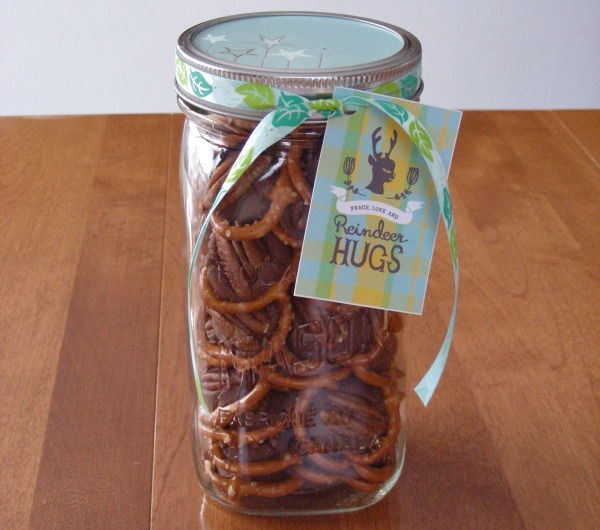 I stacked a jar full of pretzels and traced the sealer part of the lid onto an old card. I cut it out and placed it over the sealer before fastening the second part of the lid. I then added a printable reindeer hugs tag and decorative ribbon. This makes a perfect gift for that sweet tooth in your life. In large mixer bowl combine all ingredients except additional sugar. Beat at low speed, scraping bowl often, until well mixed (2 to 3 minutes). Cover; refrigerate until firm (at least 2 hours). Heat oven to 350. Shape rounded tablespoonfuls of dough into balls; roll in white sugar then in icing sugar. Place 2 inches apart on cookie sheets. Bake for 14 to 16 minutes or until slightly firm to touch. Blend all the ingredients until uniform consistency. Roll out to approximately 1/2 inch thick and cut with desired cutters. Bake for 15 to 20 minutes at 325. Whisk maple syrup and icing sugar until smooth. Lightly brush tops of cooled cookies, covering entire surface. Excess icing will drip through the racks. Let stand for 1 hour or until icing is dry. Dip half the cookie into melted chocolate and let cool. 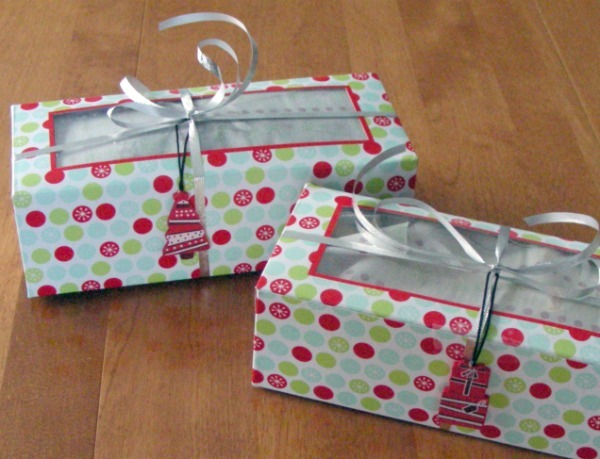 Sandi placed tissue paper and the cookies into baking boxes made by Wilton. She then wrapped ribbon around each one and attached a small tag that can double as an ornament. I hope you enjoy these recipes as much as our families do. I have to send out a special thank you to Sandi. On the day we were supposed to do the exchange, her dog took a turn for the worse and I’m sad to say he is no longer with us. He was a wonderful dog and we’ll all miss him. Christmas is often a stressful time of year for our pets, so make sure you take some time to show yours some love! Do you have any family favourite baking recipes? I’d love for you to try one of ours and let me know what you think. Happy Holidays! You are making me hungry! I am going to grab some peppermint bark… that I bought! Ha! I would be to afraid to get cookies! I do not need to eat any more sweets! Luckily my teenage son is eating most of them. 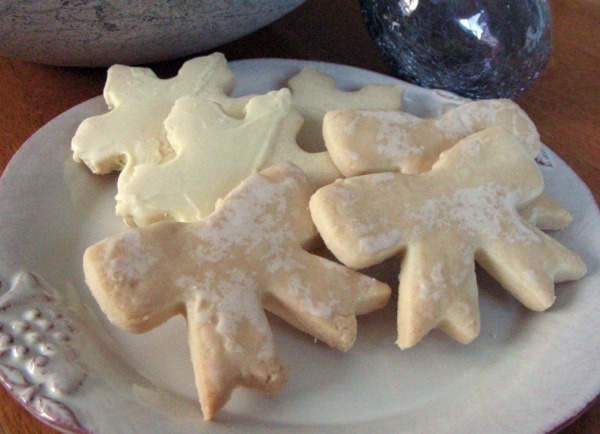 Good thing because the shortbread cookies seem to be calling my name! Happy Holidays! Wow, these look delish Shauna!! Boy is Christmas ever dangerous to my waist line, LOL. I’m doing a bunch of baking myself today! Wow! These all look delicious.